A Computer Engineer – Just another geek. Now we will add Room dependencies in our module level gradle file. Change to the latest version if available any. Sync the project and you are ready to go. Now Room SQLite structure consists of 3 things in general. We will understand them one by one. We will start from the last one. Entity is same as the model class we have in our project which contains the contractors and getter-setter methods. It’s same as our POJO class but it also represents the entity name and columns name for our database. It acts like the database table definition which displays the table name, primary key, column names, etc. Here is the example for the User table which we are going to use in our example. Now we will create an interface which act as data access object for the User entity. This DAO will communicate with the database using this entity. So basically this DAOs will handle all the queries that we fire in SQLite like insert, update, delete and read. It provides some default functionalities like insert, update, delete as well as also support the regular SQLite queries. Let’s have a look at it. Here as you can see the main benefit of the Room is it will tell you if you misspell any table name of column name so that you don’t have to run the app to detect the issue. It will directly throw you an error if such things happens. So the error are compile time error instead of run time error so it will save a lot of time and makes the code more cleaner and easy to maintain. Now we will create the database class which will contains all the entities and the DAOs from the project. It will look like this. You can include more that one entity and DAO in above class if you have any. In this database class we also initiate the database instance using which we can use the DAOs and perform database operations. Now we will see the CRUD operations one by one. Note: Please do not perform these operations on main UI thread. Use separate thread for it like AsyncTask. Please checkout sample on github for more information. You can checkout the whole example on my Github repo, I created the complete UI for it so it will be easy for you to understand it and use it in your projects. In this post, we are going to download image from server to your phone’s local storage. Here we are not using any third party library but use “HttpURLConnection” from java.net package. So let’s get started. First we will create progress dialog to display the progress of image being downloaded. 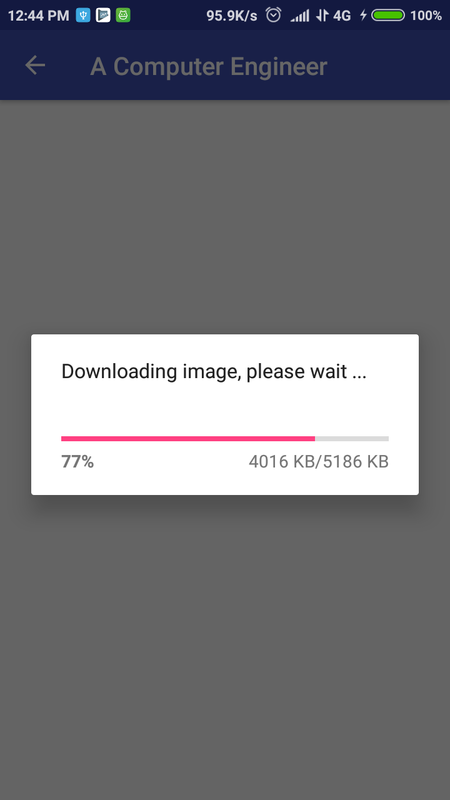 In this dialog we will show percentage and total as well as remaining size of the image being downloaded, so the user will get the idea of how much time remaining and how big is the image. So here is the code for the ProgressDialog. Here first we set the message “Downloading image, please wait …”, then we set the indeterminate flag to true because we do not know the size of the image at first. Then comes the progress style, it will be ProgressDialog.STYLE_HORIZONTAL. It will display the horizontal progress bar. The we set the cancelable flag to false so that user can not cancel the dialog while image is downloading. Then we set the progress number format, which will display the total size of the image and remaining size of the image. Here we display the data in kilobyte(KB) so we use the format “%1d KB/%2d KB”. Now we will create the AsyncTask which will download the image. Here we use HttpURLConnection which is from java.net package and does not require any third party library to download image. Here we open the connection of the image url and then get the input stream and content length of the image. Then we create file on our device’s storage and then write the data to its output stream. Here we also calculate how much image is downloaded and how much is remaining and update the same in the progress dialog. We use “publishProgress” in doInBackground that invokes the method “onProgressUpdate” with the progress value and in that method we will update the progress dialog. Here we get the content length of the image using “getContentLength()” method of HttpURLConnection class which provides data in bytes. Then we divide it with 1000 to get the image size in KB. And then we start reading the data from input stream and put a counter to calculate how much data is downloaded and update it in the UI. At the end we displayed the toast with the success message. Please make sure that you have gain the storage permission before executing the above AsyncTask. Here is the full code for above functionality. If you find any problem or doubt, please mention in comments. Do not forget to share! In this article, we will create PDF file of the current view and then save it to the sdcard(internal storage) as pdf file. Here we use PdfDocument (https://developer.android.com/reference/android/graphics/pdf/PdfDocument) which added from API 19(Android KitKat). So you can use it above KitKat version of Android. First of all we will create Bitmap of the view which we want to save on the PDF file. So for that we need to get the heigh and width of the view, so here we do all the operation in the ‘onWindowFocusChanged’ method instead of ‘onCreate’ method. So the basic structure of the file will look like this. Here we have on RelativeLayout which contains all the elements we need to print on the PDF file. So we will initialise it in onCreate and then get its width and height in onWindowFocusChanged. If you try to get the width and height in onCreate, it will be 0 because at that time the view did not rendered on the screen. So we will use the above method for that. Now we will create a Bitmap of that relative layout using following code. Later we will draw this Bitmap on PDF file using Canvas of the PDF file. Now we initialise PdfDocument and create pages in that PDF file. For that we use PdfDocument.Page class. If we have 5 pages in our PDF file then we have to create 5 object of PdfDocument.Page and add them to PdfDocument. Then we fetch the canvas of the PDF page and draw our Bitmap on it. Please check the code below. Here we can iterate the code from line 3 to line 7 to add more pages to the PDF files. After that we need to close the PdfDocument. This will draw our bitmap to the PDF file. Now to write this PdfDocument to the file on sdcard(internal storage), we need to create a File and write PdfDocument to its OutputStream. But make sure that you write this code before closing the PdfDocument pd.close(). Here is the code for that. Please make sure that before running above code, you have the storage permission granted by user otherwise you will get error. Please check for the runtime Android permission for that. Now your PDF file is saved at your provided location on your sdcard(internal storage). Draw line on canvas using your finger is very much important task if you are going to develop any kind of drawing app or image editing app. So in this tutorial we are going to see how one can draw on canvas using touch methods. First of all we create a custom view which contains the canvas and all its touch methods which performs the draw activity. This is the class which we are going to use in XML layout. You can use it in XML like this . Here we are going to add all the initialization in the second constructor as we are going to use it in the XML file. But it is advisable if you use a common method and add it to every constructor. Now we add few methods in the above class, each method has different purpose of its own. This method will give us the width and height of the view that is inflated. So if we give “match_parent” in the XML file then we can get the full width and height of the view and create bitmap and canvas of that size so that we can draw on whole visible area of the screen except toolbar and status bar. Now this method will identify the touch event and draw on the bitmap accordingly. We consider three different events here. One is when user touch the screen, second when the user move his/her finger on the screen and the last one when the user lift the finger from the screen. Here “invalidate()” calls the below method so it will draw on the canvas. The below method will draw the path(which we drew using finger) on the canvas. We will call this method every time we touch or drag finger on the screen. Now we initialise all the needed things to get started. Here Canvas is used to save the drawing when we lift the finger and started drawing again. Paint is for line that is being drawn and the background on which the line is being drawn. It includes the line size, color, stroke, etc. Path is for saving the path that we create by moving our finger on the screen. So when we lift the finger we will draw this path to our canvas and it will be drawn on the screen. And lastly the Bitmap is used to initialise our canvas with the size we are getting from the view inflated in the XML using method onSizeChanged(). Now comes the drawing part, now we will identify the touch event and save it to the “touchPath” we initialised so that we can draw it to the canvas once we lift the finger. On every action event, we also calls the “invalidate()” method so that your current moving path will be drawn on the canvas. Here in “ACTION_UP” event we draw the path “touchPath” to the Canvas c and reset the path so you can start new line when you again start drawing something. Now finally the “onDraw()” method which will draw everything on canvas and you can see your drawing on screen! The complete class looks like this. You don’t need to create custom view to display list in your AlertDialog. AlertDialog has the ability to display different kind of lists itself. Here we will see the 3 different types of methods to display the list in AlertDialog. Here we will display simple list in the AlertDialog. Here we need to provide the array of String to the AlertDialog and that’s it, it will handle the rest. We can also add Ok/Cancel button to the list but we won’t need it in the simple list. We can use this list dialog in place of dropdown list(spinner). First we declare the String array and then we create the AlertDialog. The above code will display the list in the dialog like this. Now we will display list with Radio Button in the AlertDialog. 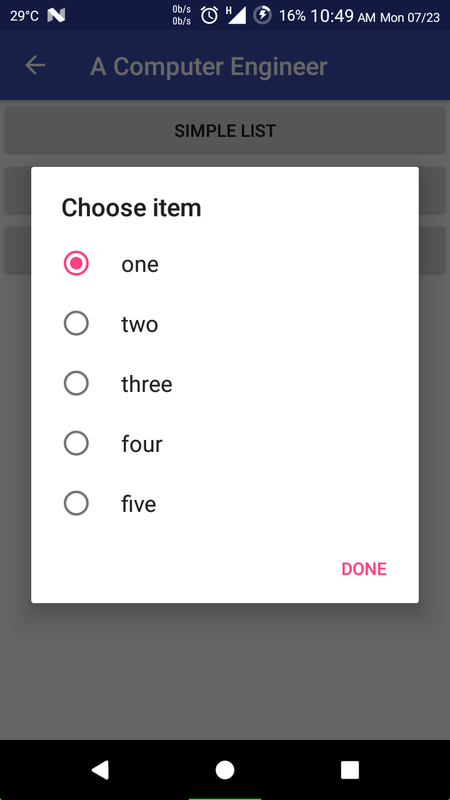 You can use such list when you want to select only 1 item from the list of items. This is similar to the first one in the functionality but the visual representation is different. Here we will add positive button(OK/Done) to confirm the selection once the user select his/her option via Radio Button. Here we use the same String array as previous one. 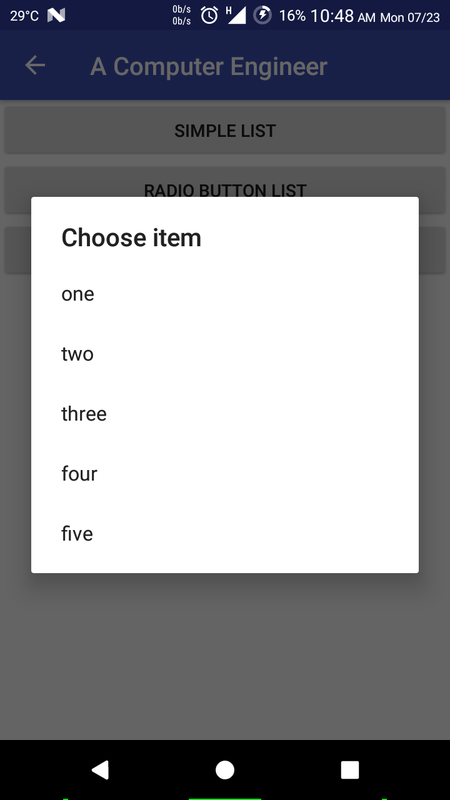 The above code will display the list in the dialog with radio button like this. This list is very important as we are going to select multiple items from the list using checkbox. We can use this list in many project where you want to select multiple items. Here we need to add confirmation button(OK/Done) after user selects all the items he/she wants. Here we use the same String array as previous one. We can also call this a multi-select list or multi select dropdown list. 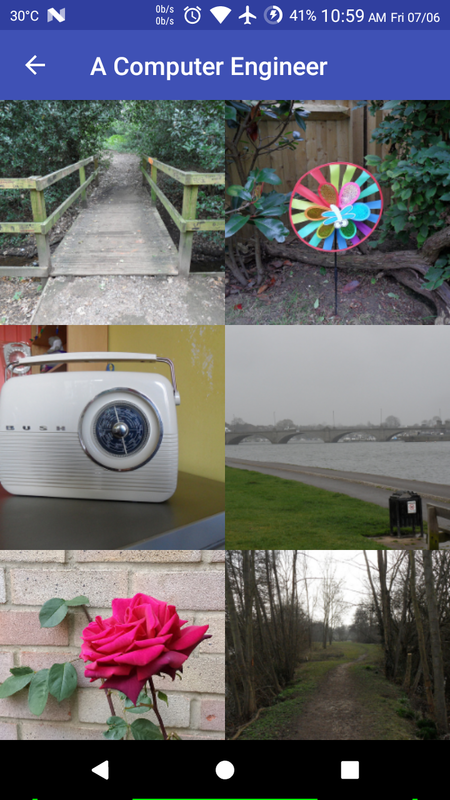 Display image grid in Android is now very easy to do with this tutorial. We use RecyclerView for this tutorial using GridLayoutManager. First of all we will create layout for this post. Now we create adapter which holds the ImageView which will go in the grid. Now we will go for the layout we used in above adapter. It just hold single ImageView. In above code, you must be thinking what is SquareImageView, right? It is the custom view which keeps ImageView square in the grid. The code for it is given below. Now we set the above adapter to the RecyclerView so that our Images will be displayed in the grid manner. Here we use images from Flickr public domain. In RecyclerView, we used StaggeredGridLayoutManager which tell the RecyclerView to use the grid like layout with the number of columns provided. Please let me know if you find any issue in the above code or have any difficulty in implementing that.